If a bathroom remodel is on your horizon, the choice of a shower door or enclosure will have a lasting impact on the final product. All-glass or frameless shower doors offer a clean and sleek look to your bathroom. The doors are made from heavier glass than typical shower doors, usually 3/8” or ½” and are attached to the walls with simple clamps or “U” channels so there isn’t any actual frame around the glass. These doors add flexibility to your shower space since they are custom made to fit each opening instead of mass produced to a standard size at a large home center. 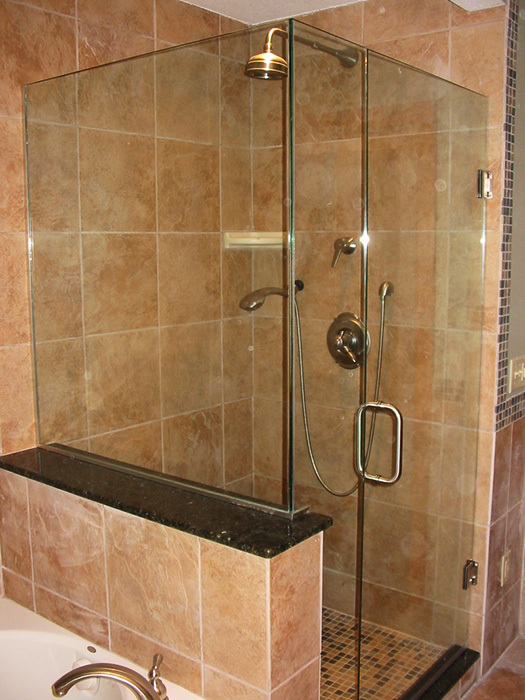 The thicker glass adds stability and durability to the shower as well as giving it an elegant and modern look. It’s also a great way to show off a beautiful or intricately tiled shower. They require strong backing in the wall to provide support for the hinges and weight of the glass. Also, since there is no frame, water can escape around the edges of the door so they work best with larger showers and where the shower head can be pointed away or placed farther from the door. And, if privacy is a concern, the glass doors and walls can be made with etched or obscure glass. For these reasons, it’s recommended to get your local glass company involved early in the design process to guarantee a successful end product. While the thicker glass and upgraded hardware provide a custom look, they also make the shower door more expensive than the framed shower doors. Framed shower doors can look bulky due to the metal surrounding the glass and continually require maintenance to reduce or the mold and mildew that builds up in the tracks. Frameless doors typically have a coating that drastically reduces the cleaning required (simply squeegee them after your shower) and the lack of metal frames leaves no place for gunk to grow.